When Sharol Geisser was 12 years old she was determined to participate in the local walk for the March of Dimes. She did it, but that evening after the walk she had to crawl just to get around. Sharol was diagnosed with juvenile rheumatoid arthritis when she was in 3rd grade, and was not able to participate in sports or even take gym class as she was growing up. JRA occurs in children under age 16 and causes joint swelling, stiffness and sometimes reduced motion. It can affect any joint and sometimes internal organs as well, and can lead to serious complications such as growth problems and eye inflammation. But that diagnosis would not stop Sharol from the walk, and—some 27 years later—it did not stop her from completing a 4,000-mile roundtrip from her home in East Helena, Montana, to Homestead, Pennsylvania. Sharol is losing her vision due to what is now rheumatoid arthritis, and she came to Blind & Vision Rehabilitation Services of Pittsburgh and its Personal Adjustment to Blindness Training program for help. BVRS’s Personal Adjustment to Blindness Training is a comprehensive immersion program that provides instruction in safe cooking, techniques of daily living, communication, orientation and mobility, exercise, sensory training, leisure time activities and more. The goal is for people with vision loss to develop the skills they need to become as independent as possible. “My first priority when I arrived here was to get the skills and the tools I needed to return to work as a nurse,” Sharol said. But that changed. Two weeks into her stay at BVRS, Sharol suffered another vision decrease. She also has glaucoma, and was experiencing elevated pressure in her eyes. “Returning to nursing is still my goal, but my top priority now is to become independent and stay independent if I lose more eyesight,” Sharol explained. The flexibility of BVRS’s programs will help her to reach those goals. During the first seven weeks of Sharol’s stay, she relied on her remaining vision as she went through training. 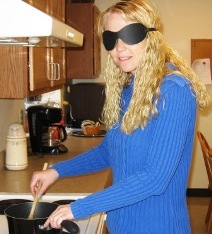 As she started her eighth week, Sharol decided to continue her training blindfolded. Sharol, who looks a dozen years younger than her 39 years, speaks matter-of-factly about her situation. “I believe you are given certain things in life that will make you stronger,” she said. Sharol did not have specific expectations when she started the Personal Adjustment to Blindness Training because she did not want to be disappointed. And she thought learning Braille would be the most challenging part. “But I learned the whole alphabet—A to Z—and the numbers and writing it in five weeks,” she said, pleased with her accomplishment. She continues to make great use of her positive attitude—which she attributes to her mother—in planning for her future. Sharol was assistant manager and head nurse at an assisted living facility, but is not sure she will be able to continue in that role because of her vision loss. She is now researching other nursing options, such as patient advocate in a hospital. © 2019 Blind & Vision Rehabilitation Services of Pittsburgh : Improving the lives of persons with vision loss and related disabilities by teaching independence and self-advocacy.